GBA Rayman Advance (USA) in 1:16:19.97 by Got4n. Rayman Advance is a side-scrolling platformer starring the titular Rayman, a big-nosed chap with no arms or legs. 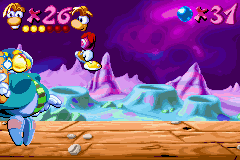 Rayman can jump and use his hair to hover for a short period of time. He can also attack by throwing his fists, or winding up his fists for a more powerful punch. He can occasionally find special powerups that grant him unlimited flying power, giving him the ability to navigate through tricky mazes. Aside from the platforming action, the other notable feature of Rayman Advance is its large, detailed and vibrant graphics, which have helped it to stand out from most other similar games in the genre. In this movie, got4n uses new skips and more optimization to improve his previous attempt by 5:11.91 minutes. If you understand French pretty well, you can watch this episode of Speed Game. The author of this TAS is namely present.